Being able to decipher the tone of a piece of writing is crucial to being able to decipher the thematic message of a text. This is absolutely true for analyzing poetry. When it comes to deciphering and analyzing poetry, tone plays an important role because of the conciseness of the text; the tone is constructed more quickly and shifts more quickly than it does with a longer piece of writing. So being able to analyze a poem for tone is essential to its overall meaning. 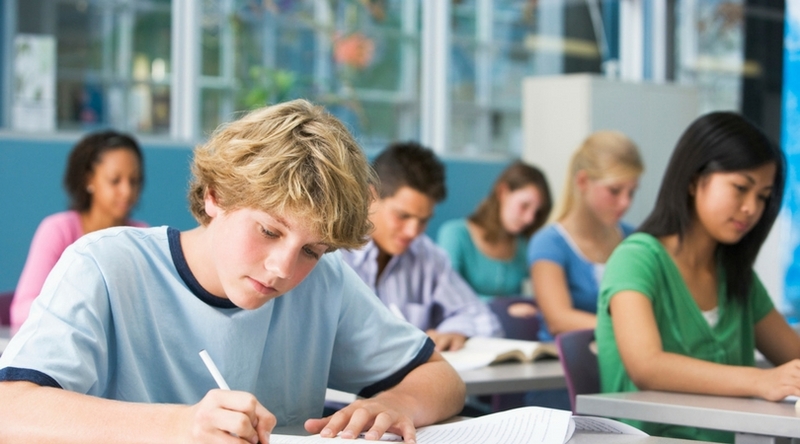 One of the strategies for helping students learn to understand the impact of tone on a thematic message is through the process of creative writing. Download a FREE LIST OF UNIQUE POETRY IDEAS & ANALYSIS HERE! When students consciously construct their own thematic messages and make conscious decisions about tone words and phrases, they can begin to understand how tone and theme relate to each other. 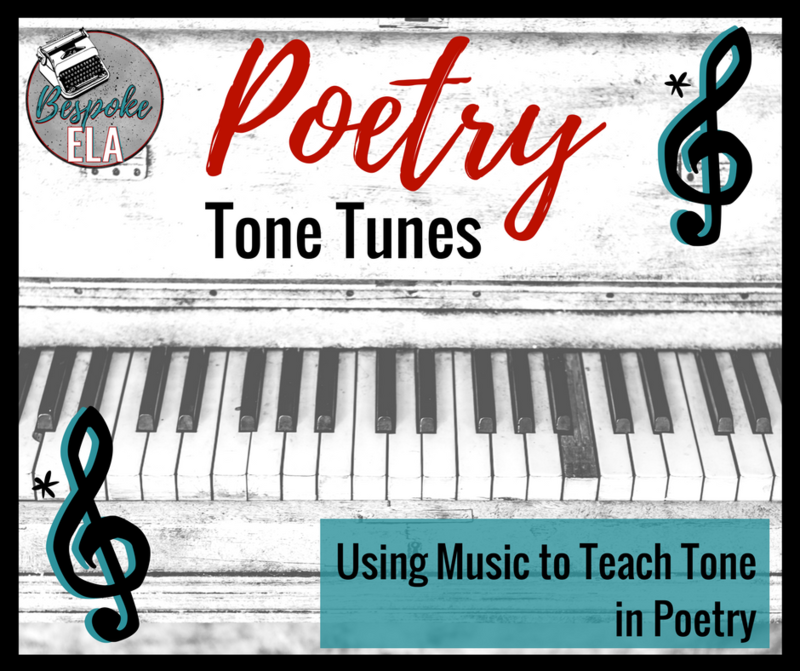 One of the activities I like to use that can help students begin to comprehend the relationship between tone and theme is called Poetry Tone Tunes. In this activity, students decipher the tone of a piece of music and then use that tone to brainstorm images they associate with it. They then use those images to construct their own original poems, making conscious decisions and purposely placed imagery to create an overall tone impression. Taking students through the creative writing process and having them consciously create tone to communicate theme helps them analyze other pieces of writing in general but also poetry in particular. 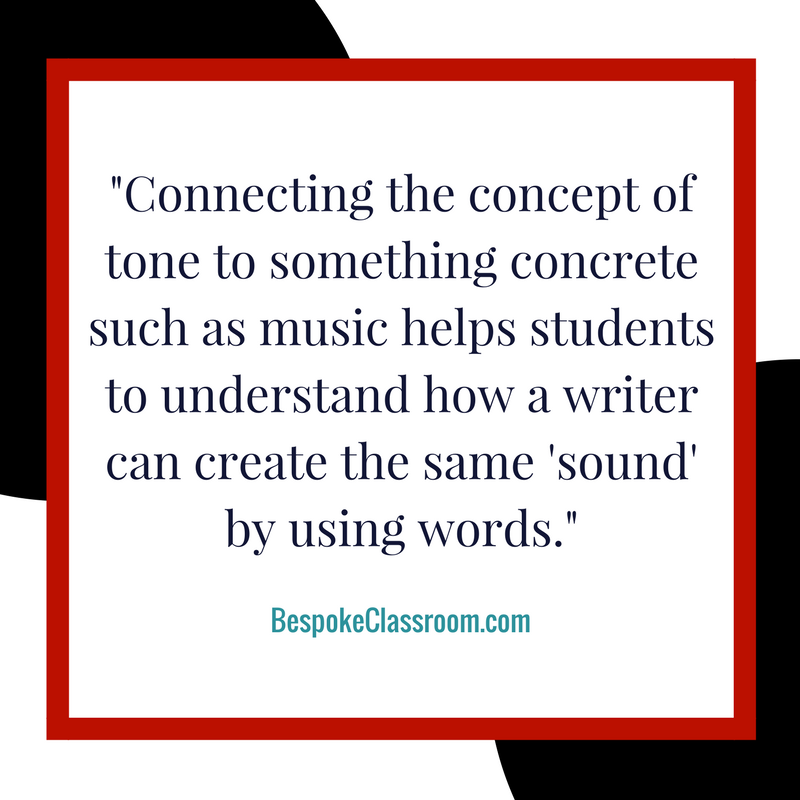 Connecting the concept of tone to something concrete such as music helps students to understand how a writer can create the same "sound" by using words. 1. Give students a list of tone words to use throughout this lesson, or have them generate their own lists of tone words. This is a great opportunity to challenge students to use SAT-level vocabulary. 2. Have students create a Tone Tunes Mind Map for this activity. Students will create the mind map on their own paper, or I like to have my students do this in their Writers' Notebooks. It contains five bubbles. The center bubble will contain the tone word, and it has four brainstorm bubbles that stem off of it. For the first bubble, students are to list any people that come to mind when they think of the tone word in the center bubble. In the second bubble, students are to brainstorm any places that come to mind when they think of the tone word. In the third bubble, students are to brainstorm any objects, or things, that come to mind, and then finally, students are to brainstorm any imagery that comes to mind when they think of the tone word. This can include anything that appeals to the senses such as colors, sounds, sights, tastes, smells, etc. 3. Once students have created their blank templates, you will play a piece of instrumental music for them that conveys a strong tone. For example, I like to begin with Moonlight Sonata, which has a very clear melancholy tone to it. You can find a link to this piece of music online HERE. As students become more experienced with the Poetry Tone Tunes activity, you can increase the level of difficulty to include pieces of music with more subtle, nuanced tones. However, I find it works best to stick to more obvious pieces of music at the beginning. I have included a list of instrumental pieces at the bottom of this article to help you get started! 4. You will play the piece of music (or a clip) a total of three times. Keep in mind that some pieces of music such as Moonlight Sonata are rather lengthy, so you may want to play a 5-minute clip of the piece for the sake of time. The first time you play it through, students are to identify a tone word they associate with the piece of music and write it down in the middle bubble of the Tone Tunes Mind Map. After the first time through the piece of music, you want to stop and discuss with students the particular tone words they chose to associate with the sound of the music. It’s important to have this conversation and discuss the elements of the music that makes it “sound” melancholy, jubilant, etc. It's also important to stop at this point and discuss the tone just in case a student has trouble identifying the tone since the entire rest of the lesson depends on this first part. 5. Then, you will play the piece of music through a second time. This time, students will begin to brainstorm images on the remaining bubbles of the Tone Tunes Mind Map. After students complete their mind maps, you may choose to stop again and have students share some of the images that came to their minds when they listened to the music. For Moonlight Sonata, students might picture a war scene, a funeral, the colors black and gray, a priest, a soldier, shadows, midnight, owls, a haunted forest, a black carriage, etc. 6. For the third time through the piece of music, students will take the images they brainstormed on their mind maps and write an original poem that communicates the tone of the music. When the piece of music finishes, give students a little more time to complete their poems, and then allow them time to share their poems either in small groups or with the entire class. 7. The final step in this process is to have students write a paragraph explication of their original poems. This step is crucial to this process because this is what we are going to be asking them to do when they analyze other poems: analyze how the poem uses tone to communicate a thematic message. So by having students write an explication paragraph of their own original poems, they will begin practicing skills to transfer and use with other poetry later on-- and they will have fun in the process! For the more advanced classes such as AP Literature, I like to have students identify two tones in the piece of music. Just like writing, music will also contain a tone shift. In popular music, we call this the bridge section. In instrumental music, this can be considered a Second Movement or a second motif. Nonetheless, an instrumental piece of music will shift tones at some point. It might be more dramatic, or it might be more subtle. But with students who are more advanced, I will challenge them to identify the two tones in the instrumental piece of music, and then I will challenge them to craft their own original poems with that same tone shift. This is more organic to poetic construction because most poems contain a tone shift. Note that including the tone shift as part of the activity will require that you play more of the piece of music, so you may only have time for one piece of music in a single class period. Another way you can differentiate this activity with students is to give them a pre-selected tone word and have them brainstorm images together in groups, or you can even give them a completed Tone Tunes Mind Map and have them write a poem in groups using the images from the lists. 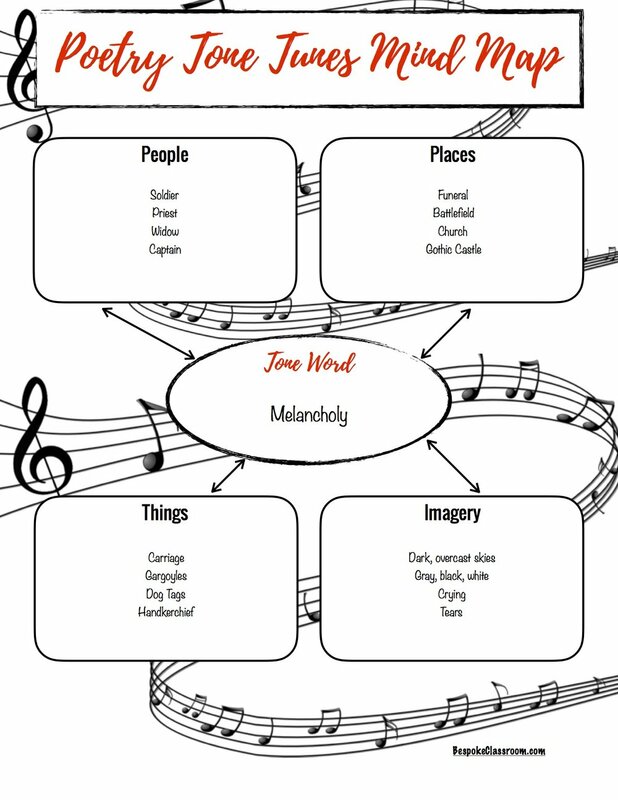 The Poetry Tone Tunes activity is a great way to help students “hear" the effect of tone on a thematic message and to see how a writer selects images and words to communicate an overall impression. Give it a try and let us know how it goes! Be sure to download the free Poetry Tone Tunes lesson from Bespoke ELA! There are many pieces of instrumental music available on YouTube that you can use for this activity. In fact, you can go to YouTube and type in the tone word + "instrumental music" and find something that will work (i.e. "happy instrumental music"). Just keep in mind the length of the pieces and how you can fit them into the timeframe of your class period. I usually try to do two music clips within one class period that have contrasting tones and then have students select one of the two poems they’ve written to explicate for homework. Also, since the goal is to have students generate their own original images in order to practice with tone, it's important to avoid pieces of music (say, movie themes) that are well-known or are associated with famous images (say, Harry Potter). Click the image to follow Bespoke ELA on Instagram! Click here to download your FREE POETRY CALENDAR FOR NATIONAL POETRY MONTH! FREE CALENDAR for NATIONAL POETRY MONTH!